TORONTO, ONTARIO, March 23, 2018 – Talk about going big in the Big Apple! For the first time in North America, Toyota’s newest, stylish, and most technologically-advanced compact car in the world, the all-new 2019 Corolla Hatchback, makes its debut at the New York International Auto Show. Don’t let its diminutive dimensions fool you – the hatchback, in either S, SE or XSE grades, is all about making a huge impression. With its lengthy list of standard features that includes Entune 3.0 with Apple CarPlay; a revised sport-tuned suspension and new Toyota New Global Architecture (TNGA) platform; and the first North American application of Toyota Safety Sense 2.0, Corolla Hatchback strikes a resounding chord with drivers who value authenticity, utility, practicality, and style. Corolla Hatchback has flair extraordinaire. With a theme of Shooting Robust, along with a design goal of Agile, influencing their every pen stroke, designers created a form that is simultaneously distinct, dynamic, muscular, and sophisticated. Shooting references the design’s sport coupe traits implemented in all facets. With those concepts in mind, Corolla Hatchback is a meticulously mixed cocktail of emotive lines, creases, and surfaces. It’s lower (by 25 mm), wider (by 30 mm), and longer (by 40 mm) than its predecessor, Corolla iM. It also has wider front and rear tracks, and a longer wheelbase. Its hood sits 47 mm lower than before, affording passengers excellent forward visibility. The new frontal styling with a rounded nose and trapezoidal-shaped under grille is a further evolution of Toyota’s Under Priority Catamaran and Keen Look design philosophies, both of which emphasize Corolla Hatchback’s increased width. Slim, J-shaped Bi-Beam LED headlamps wrap deep into the front fenders and accent the front in both stylishness and precise illumination. Front overhang has been cut by 20 mm; at the rear, it’s 20 mm longer. Chiseled character lines at its profile link both ends’ protruding flanks making for an active, well-planted expression that is uncommon amongst its peers. Wheel sizes range from 16-inches to 18-inches in diameter. Its new rear style articulates Corolla Hatchback’s overarching emphasis on athletic presence. The relationship between front and rear design is closely aligned given the rear’s more rounded physique that encompasses simple, condensed, yet powerful, three-dimensional landscapes. Its hatch – now made from TSOP (Toyota Super Olefin Polymer) and ABS (Acrylonitrile Butadiene Styrene) – is not only lightweight to aid fuel efficiency, it is set at a steeper angle (moved 14 degrees forward) for that ultimate sporty look. The rear all-LED taillamps feature a diffusing inner lens designed to highlight the hatchback’s stout stance. And the rear bumper styling echoes the frontal Under Priority Catamaran design with its thin lower lip and chrome diffuser. Differentiation between S, SE and XSE is distinct. All grades receive LED headlamps, LED taillights, and a rear spoiler. XSE ups the ante with 18-inch wheels, LED fog lights and chrome front grille surround. The Bi-Beam LED units move vertically and horizontally to provide optimal light output by analyzing steering angle, vehicle speed, and the vehicle’s longitudinal axes angle to adjust lamps. 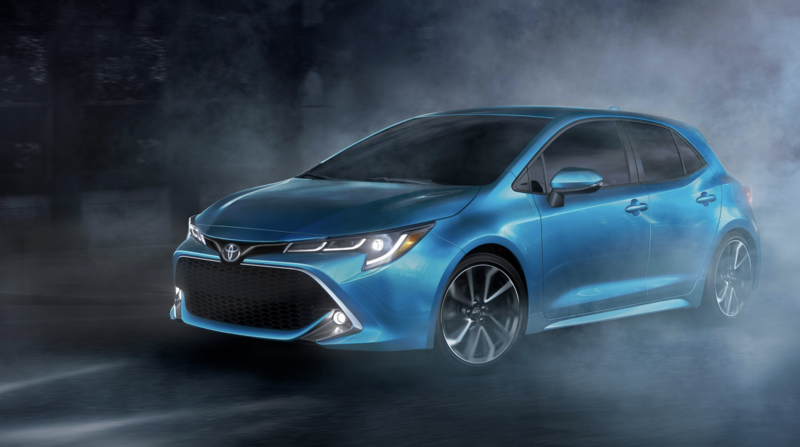 Corolla Hatchback’s colour range includes the new-for-2019 color Rival Blue, as well as Blizzard Pearl, Silver Metallic, Midnight Black, Galactic Aqua Mica, Scarlet, and Oxide Bronze. Simple. Warm. Inviting. Sensuous. Descriptors like these inspired designers’ efforts when visualizing Corolla Hatchback’s cabin. Sensuous Minimalism marinates the entire capacious space. From their supportive sport seats, front passengers are faced with a neat instrument panel that lends an open, harmonious feeling thanks to its 22 mm thinner upper surface and 43 mm wider centre console dividing passengers. At the centre of the instrument panel resides a standard high-resolution 8-inch multimedia touchscreen. The centre stack screen provides access to vehicle settings, audio controls, navigation, smartphone, and Entune 3.0 apps. Climate controls, located below the multimedia portal, are fashioned in a bright, highly visible digitized configuration. In addition to being wider, the centre console is also longer to accommodate a larger variety of passenger physiques and comfort preferences. It incorporates a centre tray ahead of the gearshift that can hold small items such as a smartphone or wallet, or if outfitted, serves as the Qi wireless device charging area. A 140 mm smartphone can easily fit inside the centre console box. High-gloss materials are paired with matte elements – silver accents with Piano Black and available contrasting stitching – to best accentuate a premium look and feel. The elimination of unnecessarily lettering on switchgear, plus, the unification of all materials’ and elements’ shape, colour, grain, and gloss, maximize continuity and aesthetic cleanliness. Tactility, too, is minded with the utmost consideration. Keen eyes will appreciate the minimized gaps between buttons and switches; again, furthering Corolla Hatchback’s sophisticated character. Front passengers’ hip points are lower (to 275 mm), and cushioning has been revised, which provides a more natural body posture and position for ideal access to the multifunction steering wheel, pedals, and gearshift. Such optimized seating allows passengers to enjoy Corolla Hatchback’s thrilling dynamics all the better. Front door storage solutions include cup holders capable of accommodating 750 ml bottles and A4-sized documents. Not to be outdone, rear seats utilize updated cushioning to improve comfort and minimize fatigue. Furthering their convenience are upper door cup holders that accommodate 470 ml bottles. The standard amenity list is as impressive as the cabin’s aesthetic. S grade is equipped with single-zone automatic climate control, 4.2’ multi-information display and push-button start with three-door SmartKey system. An electronic parking brake, automatic up/down windows, and two front USB outlets are standard as well. The SE grade adds 16” aluminum alloy wheels, heated front seats, a leather shift knob, and paddle shifters located behind the leather wrapped steering wheel, as well as an anti-theft system with engine immobilizer. Available features on SE Upgrade version include 18” aluminum alloy wheels, heated steering wheel and Blind Spot Monitor. XSE grade builds on SE Upgrade’s amenity palette by including dual-zone climate control, combination leather (leather with mélange-like fabric) seating, and eight-way power driver’s seat. XSE’s instrument panel and doors receive unique stitching, and behind the multifunction steering wheel, a 7-inch TFT Multi-Information Display (MID) shows vehicle information, turn-by-turn navigation, and various vehicle settings (including those pertaining to Lane Departure Alert, Lane Tracing Assist, Pre-Collision System with Pedestrian Detection and Blind Spot Monitor). While electrifying in functionality and personality, Corolla Hatchback delivers a civilized, quiet ride. Powertrain drone and road noise have been culled thanks to revised drivetrain efficiencies, plus, the widespread implementation of sound-absorbing materials, sealants, foams, resonator ribs, and silencers. Its TNGA structure utilizes additional seals in its body panel gaps to insulate noise penetration and enhance air sealing performance. Corolla Hatchback’s Aero Stabilizing Fins located on its taillights also combat wind drone. There’s no shortage of entertainment and connectivity capability inside Corolla Hatchback either. On S and SE grades, standard Entune 3.0 Audio includes 8-in. touchscreen; six speakers; Apple CarPlay; Entune 3.0 App Suite Connect; Scout GPS Link Compatible; Siri Eyes Free; Auxiliary audio jack and USB 2.0 port with iPod connectivity and control; AM/FM; MP3/WMA playback capability; Voice Recognition training and tutorials; Hands-free phone capability; voice recognition and music streaming via Bluetooth; Customizable Home Screen; and Weather/Traffic info via Entune 3.0 App Suite. Entune 3.0 Premium Audio, standard on XSE, adds HD Radio and Weather/Traffic info; SiriusXM with Cache Radio; Entune 3.0 Connected Services; Dynamic Navigation; Dynamic POI Search; and Destination Assist Connect. Qi Wireless Charging is also available on SE Upgrade and standard on XSE. Rounding off Corolla Hatchback’s connectivity are two USB terminals (located inside the centre console and instrument panel) and one AUX port (located on instrument panel). Corolla Hatchback’s seamless unification of comfort and sporty controllability begins at its TNGA C platform. The compact structure employs a mixture of adhesives, spot welding, and additional bracing – top to bottom, side to side – for the benefits of driver controllability and low fuel consumption. On-road feel and fuel efficiency is further refined through the extensive use of aluminum and high- and ultra-high tensile steel in the lighter weight chassis and body. In fact, torsional rigidity is improved a massive 60 percent compared to its predecessor. Affixed to this musculature are revised front and rear suspensions. Its front MacPherson strut setup’s geometry is changed (i.e. updated bound stopper clearance; stabilizer location) and incorporates other key augmentations like revised coil spring rate and damping force, and reduced friction in sliding parts. This all makes for a high-quality steering feel, ride comfort, and handling stability. At the Corolla Hatchback’s rear multi-link suspension with stabilizer bar, responsiveness is sharpened through updated shock absorbers and springs, and like the front, geometry is slightly modified. Lower arm locations have moved (for improved toe-in angle during higher-speed maneuvering), as has shock absorber placement (moved forward for better cargo capacity and reduced longitudinal low frequency input). Overall, front and rear suspension friction has been reduced by 40 percent, and its centre of gravity is cut by a substantial 20 mm. The end result: A Corolla Hatchback that possesses an uncanny blend of balance, composure, and feel that’ll have its driver pining for windy roads – time and time again. TNGA isn’t just the genesis of Corolla Hatchback’s astute footwork and balance: An all-new TNGA-based powertrain is the heart of Corolla Hatchback’s Fun-To-Drive identity. The 2.0-litre Dynamic Force direct-injection inline four-cylinder engine (M20A-FKS) adopts the latest in Toyota technology and structural efficacies for gains in power, fuel efficiency, and cleaner emissions. Physically, the engine is smaller and lighter than its 1.8-litre four-cylinder predecessor, which helps to lower Corolla Hatchback’s centre of gravity and benefits its overall balance. The 2.0-litre is also quieter for improved Noise Vibration Harshness (NVH) with additions like a more rigid crank case with integrated stiffener; a lighter resin cylinder head; and a ribbed oil pan. The M20A-FKS is equipped with Toyota’s latest D-4S fuel-injection that uses high-pressure direct- injection and low-pressure PFI (Port Fuel Injection). The setup adapts its injection method based on driving conditions so that ideal combustion is executed. The engine also features Dual VVT-i (Variable Valve Timing-intelligence), with VVT-iE (Variable Valve Timing-intelligence by Electric motor) on the intake side and VVT-i on the exhaust. VVT-iE uses one electric motor instead of oil pressure to control the variable valve timing. Together, the valve timing systems enhance power output and fuel mileage, and cut harmful emissions. Be they a commuter or canyon cruiser, drivers will appreciate Corolla Hatchback’s available transmissions: an all-new Direct Shift-CVT (K120), or a six-speed iMT manual transmission (EG60). The Direct Shift-CVT has simulated 10-speed Sequential Shiftmatic steps, Sport Mode, and available paddle shifters. It features a number of innovative elements, including the world’s first launch gear in a passenger vehicle CVT. Having a launch gear facilitates improved transmission efficiency in lower gear ratios where belt efficiency is typically poor. The transmission system utilizes gear drive when starting from a full stop, resulting in powerful acceleration, while at the same time, resolving the momentary sluggish feeling that was previously present during accelerator operation. Both smooth and comfortable launch performance are realized. When switching from gear drive to belt drive, the transmission system uses highly responsive gear change control technologies cultivated from automatic transmission technology. With its launch gear in place, the belt has been tuned for higher gear ratios. This new setup not only improves the efficiency of belt operation, but it also enables the adoption of wider gear ranges, thereby realizing a class-leading gear ratio range of 7.5 for the 2.0-litre class. Another benefit of the launch gear is a reduced input load. This enables the size of both belt and pulley components to be reduced. Furthermore, the belt angle has been narrowed and pulley diameters reduced, resulting in shifting speeds that are 20 percent faster. Powerful and predictable acceleration is realized, as has an endearing driving experience. But the more involved driver will be engaged by the all-new six-speed iMT with downshift rev-matching control. Compared to the existing manual transmission, the new gearbox is lighter (by 7 kg; total weight of 40 kg) and shorter (by 24 mm), making it one of the world’s smallest transmissions. Its small size contributes to improved fuel efficiency. The gearbox also offers world-leading transmission efficiency, while the use of iMT controls, which automatically adjust engine revolutions when changing gears, ensures smooth gear shifting―free of uncomfortable recoils―for the driver. Toyota continues to lead the pack when it comes to safety, and the all-new Corolla Hatchback provides drivers and passengers with standard safety technologies that take one step closer to achieving the ultimate goal of zero casualties from traffic accidents. Corolla Hatchback comes standard with TSS 2.0, the second generation of Toyota Safety Sense (TSS). The updated safety package adds new active-safety technologies and capabilities that enhance protection. Capability to detect a preceding vehicle or pedestrian in daytime or nighttime (nighttime is new), or daytime bicyclist (new), and alert the driver (audible and visual warnings) and/or apply brakes to help mitigate or avoid the collision in certain cases (using Forward Collision Warning (FCW), Brake Assist (BA), and Automatic Emergency Braking (AEB)). For highways/freeways only. Full-Speed Range DRCC is standard on all Corolla Hatchback models, except those equipped with a manual transmission. Those having a manual transmission are equipped with DRCC. Full-Speed Range DRCC is an adaptive cruise control that is designed to function at speeds between 0 to 180 km/h and enables low-speed speed matching, stopping, and acceleration/deceleration relative to a preceding vehicle traveling at a slower speed. Speed, cut-in, and distance control enhanced, as well as Turn Signal Linked control added, for more natural response. Newly added to LDA w/SA is the capability to detect the road’s edge, in addition to the pre-existing capability to detect visible lane markers and the vehicle’s position in the lane. If unintentional lane deviation is detected, the system alerts the driver with audible and visual warnings. Steering Assist provides small corrective steering inputs momentarily to help the driver prevent the vehicle from unintentionally leaving its lane. Capability to automatically activate and deactivate high beams based on driving environment and preceding vehicle’s lights. For highways/freeways only and can be enabled when using DRCC – Capability to recognize white or yellow lane markings or the path of a preceding vehicle if lane markers are temporarily not available; to identify and actively track the center of the lane by providing steering assistance to the driver (hands-on, driver-assist system). Reduces driver burden and supports safe driving, especially in traffic congestion or long highway trips. The LTA system can be turned on/off. The 2019 Corolla Hatchback has seven standard airbags and Toyota’s Star Safety System, which includes Enhanced Vehicle Stability Control, Traction Control, Electronic Brake-force Distribution, Brake Assist, Anti-lock Braking System, and Smart Stop Technology. Blind Spot Monitor (BSM) is standard on XSE and available on SE. (Please note: BSM does not include Rear Cross Traffic Alert.) Corolla Hatchback also comes equipped with a standard backup camera.